for information about how to register to vote, where to vote and who is on their ballot. 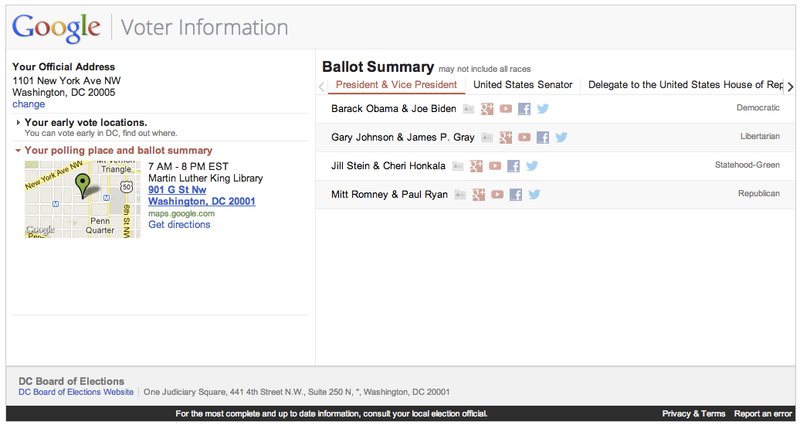 Even though it is 2012, important voting information is disorganized and hard to find on the Internet. To help voters research candidates and successfully cast their ballot on Election Day, we’ve launched our new Voter Information Tool. You can enter your address to find information on your polling place, early vote locations, ballot information with links to candidates’ social media sites and voting rules and requirements. The tool is easy to embed on any website and is open source so developers can modify it to create custom versions. We're working with a number of media partners to ensure the tool is accessible across the web, and partners like Foursquare and AT&T are doing great work building apps on our Civic Information API. We hope this tool will help make getting to the polls and casting your ballot as simple as possible. Every four years in the United States, people prepare to head to the polls and increasingly search for information about how to register to vote, where to vote and who is on their ballot. Even though it is 2012, important voting information is disorganized and hard to find on the Internet. To help voters research candidates and successfully cast their ballot on Election Day, we’ve launched our new Voter Information Tool. I'd be nice if this could be embedded in Blogger. Maybe the people who put together this neat tool could get to know those people and see if any of your systems are compatible with theirs. As a campaign manager for a few local races I would like to be able to add our candidate's website and social media sites to your tool. How can we go about making that happen? My cousin recommended this blog and she was totally right keep up the fantastic work!! How sad that our right to vote has been so compromised by crooked politicians in so many "swing" states like FL. Election shenanigans, faulty machines, intentional misinformation, governors callously reducing early voting times and polling locations resulting in hour long waits to vote. Whatever happened to "playing fair" and "winning fairly and honestly"? When did the U.S become a third world country where democracy is just a word and idealistic dream and fraud prevails at the polls? The political machine on both sides should be ashamed and it's an embarrassment to our nation and to every honest American. Wow So Good information U Got There. Very Nice.